Think you know digital radio? Think again. Do you think you know digital radio and all the great benefits you only get with digital radio? Did you know that over 90% of the country can now receive DAB digital radio? Did you know that there are over 40 national stations to choose from in most of the country? Did you know that there are loads of great DAB digital radios available in store and online with all kinds of clever features? Did you know that it’s easy to get digital radio in your car? Did you know it’s easy to take digital radio with you wherever you go on you smartphone or tablet? And did you know that if you have a connected or smart speaker, you can listen to digital radio on it too? If you love radio... and you haven’t tried digital radio, then it’s time to think again. There are lots of ways to listen to digital radio. There are lots of DAB digital radios to choose from – such as a portable, kitchen, bedside or clock radios or integrated into a home audio system or hi-fi. DAB digital radios tune at the touch of a button, display station and track information and lots have additional features such as Bluetooth, and you’ll find a range of prices to suit all budgets. 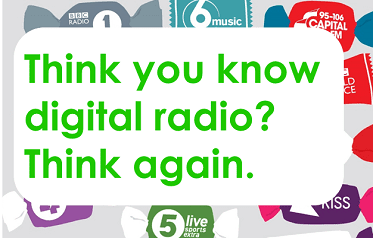 If you’re buying a digital radio, look for the digital radio tick mark. It means the product has been tested and approved and is future ready. You’ll find the digital tick on a wide range of products from leading manufacturers including Pure, Ruark, VQ, Sony, Philips and Panasonic. It’s easy to get digital radio in your car. Most new cars now come with digital radio fitted as standard, so if you’re buying a new or used car, make sure you opt for one with DAB digital radio. Any car can be converted. You can upgrade via a replacement radio or an easy-fit DAB digital radio adaptor which can be fitted to your dashboard and connects to your existing radio. Some radios will require professional installation and if you need help there are registered tick mark installers at Halfords and independent retailers. Find your nearest registered digital radio installer here. You can connect your smartphone in your car via an aux in cable or Bluetooth and listen via app. You can search online and listen to stations through speakers or headphones plugged into your desktop or laptop computer, or tablet. Download your favourite station app, Radioplayer or BBC iPlayer Radio app to take your favourite stations with you wherever you go. You can listen through headphones and if you have a connected or smart speaker you can connect with Bluetooth to listen out loud too. If you have a Sonos, Amazon Echo or Google Home, then you’ve got digital radio and hundreds of stations right there for you to discover. You’ll find everything you need to know how to listen to your favourite radio station in your device’s control app. Digital radio is available via all digital TV platforms (digital terrestrial, satellite and cable). Check your EPG to see which stations are available on your digital TV service.